Once an aquarium is put into operation, the characteristics of the water change fairly rapidly. These modifications are a result of the biological activity of living beings - plants, fish, and invertebrates - as well as various chemical reactions that occur in the water and sediment. In this way the water gradually becomes loaded with suspended matter - animal excrement, vegetable debris, surplus food, sometimes even dead bodies - and suspended solids produced by the activity of the occupants. 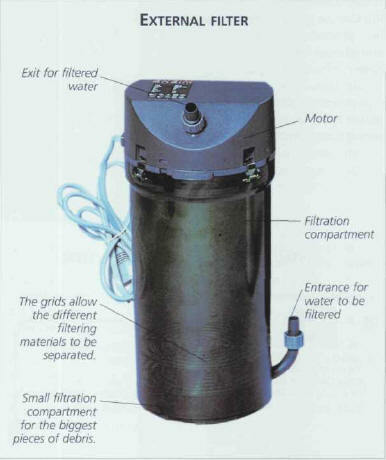 External filter with several filtration compartments. Of these, the most significant are the nitrogenous products released by animals' liquid excretion. These substances are very toxic, and so their accumulation is a cause for concern. The suspended matter remains in open water, or ends up as sediment. In either case, it is visible. The suspended solids on the other hand, are not visible, and therein lies the danger. It is however, possible to ob-serve a slow modification of the water color; in the long term, it takes on a yellowish color. This alteration can be detected very early on by immersing a white object. 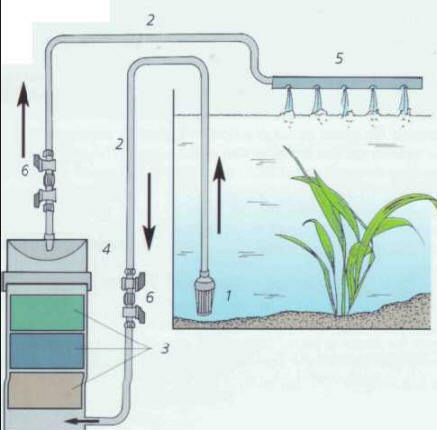 Filtration therefore aims to trap the suspended matter, in order to attain clear water that is more receptive to the penetration of light and avoid any risk of intoxicating the residents of the tank. As we have already pointed out, filtration also contributes to good oxygenation. You must not, however, neglect to remove the biggest scraps yourself. 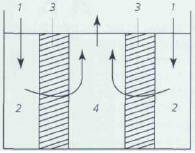 Several filters function by retaining suspended matter: this is mechanical filtration. The filtering media gradually become clogged and must be cleaned or changed. In order to transform nitrogenous substances and encourage the nitrogen cycle (see page 19), oxygen and good bacteria are required: this is biological or bacterial filtration. The biological filter therefore comprises a support that will be colonized by bacteria, with circulation of water to provide oxygen. The medium in mechanical filtration serves the same function as a biological filter once it has been colonized by bacteria. The water travels from top to bottom through the sand and is taken back in under a platform that is slightly raised from the bottom of the tank. The water is then pushed out into the aquarium by means of an air-lift (see panel on page 239) fed by an air pump. Here, it is the sand which acts as the filtering medium, via a double action: first mechanical, as it retains the particles that are in suspension, and secondly biological, as the nitrogen cycle is created by the bacteria and the oxygen supplied by the circulation of the water. The size of the grains of sand is therefore important (for more detail, see Choosing the Bed, page 260), as it must allow both the water to pass through and the particles to be retained. This is why you should avoid sand that is too fine and, at the other extreme, sediment that is too thick. The under-gravel filter used to be extremely popular, but these days it has given way to other techniques. However, it can be used in small temporary tanks or in a community tank, but with a slow and continuous flow, as a complement to another filtration system. when the filter is inactive for a while, there is a risk of deoxygenating the bed, which can cause the development of toxic products. These also work with an air pump, but a small filtering medium, often made up of foam, replaces the sand. They are only effective in small aquariums with a capacity of 50 liters or less. You can make this type of filter at home. Take a PVC receptacle that is easy to cut, ideally a bottle with a capacity of 1.5-2 liters. The use of foam tends to make the apparatus float to the surface, so you must insert a ballast to weigh it down. 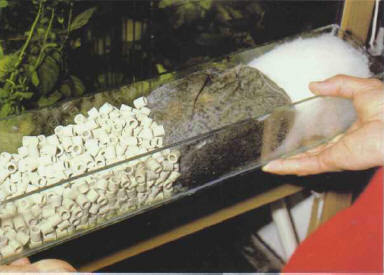 The upper part of the foam can be covered by coarse, heavy material, such as gravel or sand, serving not only as ballast but also as a pre-filtration element (see box below). This ingenious system allows water to be raised to a certain height and also helps to stir, and therefore oxygenate it. As a rough guide, an air-lift with a diameter of 3 cm, fed by an air pump, has a flow of several hundred liters per hour, with a water depth of 40 cm. 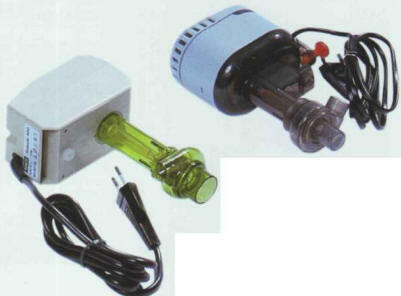 The air-lift makes it possible to use an under-gravel filter or a drip filter, or send water from a box filter into the aquarium. In order to reduce the noise of the bubbles and enhance the circulation of the water, its top section can be bent to be flush with the surface. This type of air-lift is available in the aquarium trade. It can also be made at home, using a pipe and a PVC bend (2-3 cm in diameter). It is attached to the tank with suction pads. The motor makes it possible to draw up the water through a thick grid that blocks the passage of the larger pieces of debris. The water is then guided towards a filtering medium, such as foam or Perlon, before being expelled into the aquarium. This system works well but is insufficient for an aquarium with a volume of over 100 liters, although there are models available that can be adjusted according to the volume of water being treated and that will prove effective. 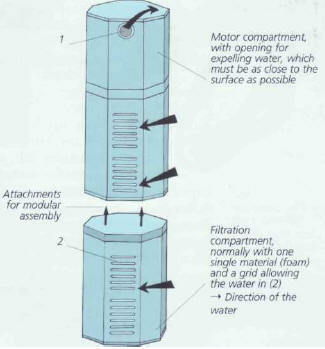 The outflow of the motor is sometimes excessive for the volume of the filtering medium. The latter must be cleaned regularly as it gets blocked up - it can be inspected through the PVC of the filtration compartment. 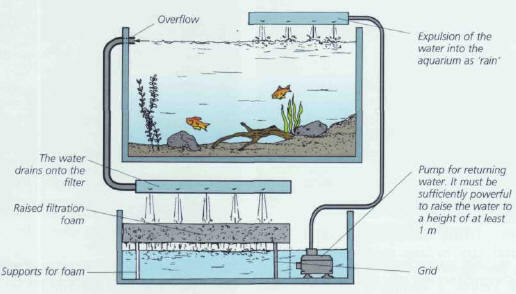 The water siphoned into the aquarium passes into a filtration bay containing several filtering media and is sent back into the tank by means of an electric pump. There is a variety of models available, depending on the power of the pump and the volume of the filtration bay. It is even possible to find filters for garden ponds. 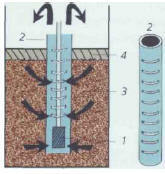 These filters are highly efficient; their main disadvantage lies in the amount of space taken up by the equipment, with the pump and filtration bay outside the aquarium, and the pipes for sucking in and expelling the water inside. 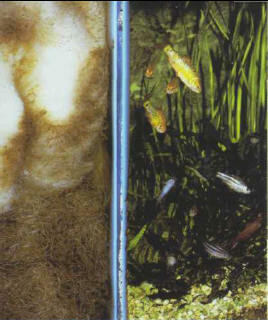 For a small tank, a small internal filter, using either an air-lift (left) or an electric motor (right) is sufficient. These are suitable for large aquariums - some have a flow of 1 mVhour - and contain materials with various particle sizes in the filtration compartment. They must be placed at the bottom of the tank to avoid any possible draining. These filters are more expensive than those already described, but, though they are mechanically very efficient, they are not effective in biological terms. 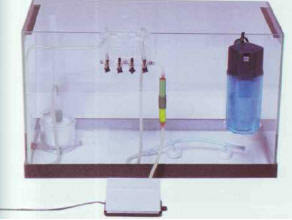 The use of particles of different sizes prevents the apparatus from getting blocked up too quickly. It is easier to clean if you have the foresight to install faucets on the pipes. These are sometimes built into some aquariums on the market, but they can also be added afterwards. In the latter case, they must be hidden by exterior fittings. The use of this type of filter is becoming more widespread, as it is easy to put into operation and maintain. 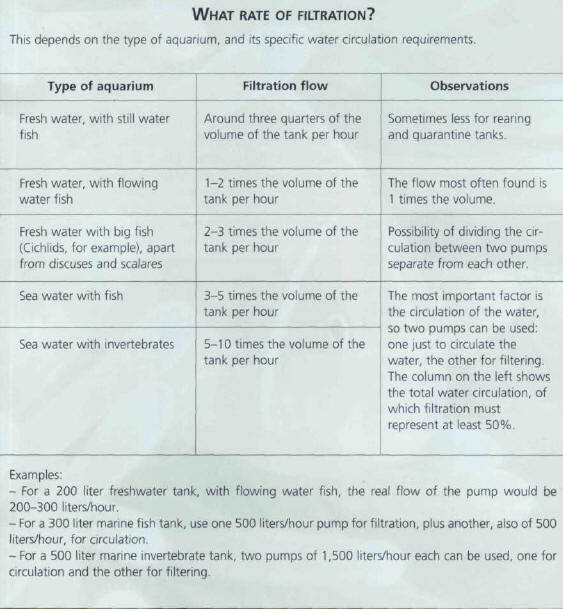 In a large aquarium, however, its mechanism - the retention of particles - can prove insufficient, and so a complementary external filter must also be used. A box filter integrated into an aquarium. The box filter is normally placed on one of the sides of the aquarium. Wherever it is put, it is vital that the volume of the filter is equal to at least 10% of the volume of the aquarium. In the diagrams above, the aquarium is seen from above, with the front at the bottom of the drawing; the foam is represented by hatching. The decor can be artificial. Entrance for water through a hole in the glass, protected by a grid. A siphon with a strainer on the end (la) can also be used. The grid or strainer prevents fish passing through, apart from the smallest fry, which can sometimes be recovered in the box (2). Both must be maintained regularly, as various bits of debris, particularly vegetal matter, build up there, slowing down or even preventing the circulation of the water. Box. This can contain a pre-filtration material, such as Perlon (page 248). 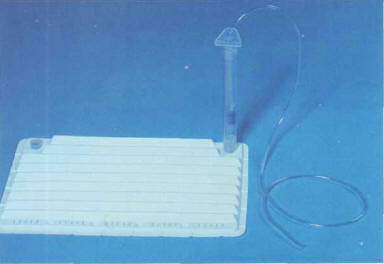 In sea water, it is an ideal replacement for the protein skimmer (page 250). Filtration foam (page 248). This retains fine particles and is the medium for the biological filtration. It is easier to maintain if it is divided into two approximately equal parts. 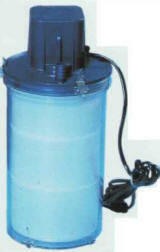 Sump for keeping water before it is sent back into the aquarium by a pump or air-lift. This part of the box filter can receive heating and aeration. There is a variation on this system: the double box filter. Here, the filtering media are not totally submerged in the water, but are sprinkled by it. This means that they are in permanent contact with the air, encouraging good oxygenation of the water and effective functioning of the nitrogen cycle. This technique is particularly popular among experienced fishkeepers with large freshwater or marine tanks. There are two systems: the gutter filter, which has long been in use, and is easy to set up, and the more recent wet-dry filter, placed under the aquarium, which requires more space. In both of these cases, coarse pre-filtration media are desirable. - Gutter filter: the water is pushed up from the aquarium by an electric pump or an air-lift to a horizontal gutter equipped with filtration material. The water then passes along the gutter and falls as 'rain' into the tank, thereby enhancing the oxygenation. Chicanes can increase the time taken by the water's journey and, therefore, its oxygenation. - Wet-dry filter under the aquarium: this is considered the ultimate filtration system by some aquarists. The main problem in setting it up lies in the incorporation of an outlet for excess water in a side wall or the back of the tank. The water descends into another tank and drains through the filtering medium, before being pumped back into the aquarium. Some manufacturers market small internal wet-dry filters, which are intended for aquariums of a maximum volume of around 200 liters. ДХУНДХУМАРА , в индуизме мифический царь солнечной династии, убивший Дхундху.